Deb Marshall attends the JAH Breyer Velvet Rope event! 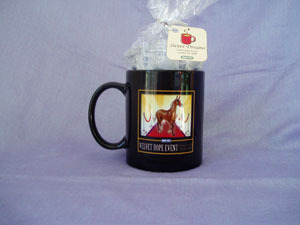 It started with, "I'll put your name on as guest attending & you put my name as guest attending on your card".....This was how it began that I was lucky enough to be drawn via raffle held by Breyer's JAH for a chance to attend the Breyer Velvet Rope Event on October 24, 2009. 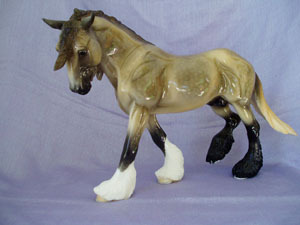 I had maintained a friendship with Becky Cunningham, an email buddy that I sold a Chinook Indian Pony on ebay to. We discussed on a whim of liking to attend the VRE in October and getting a chance to meet each other in person for the first time....so we sent our cards in on whim and a prayer! When the list came out and Becky's name was listed as a winner, I was beside myself with excitement! I WAS going!! Fast forward to Oct. 23rd...Jody Sumner, another email buddy & another lucky (Breyer Velvet Rope Event) VRE winner, who graciously offered to pick me up at the Newark airport, met me there with her children and big Breyer sign!! Off we went to the host hotel to join the others...I called Becky and asked her to meet me in the lobby, as we had never met in person. We hit it off immediately and I got to meet Becky's mom, Martha, who made me feel right at home with her chocolate kisses and lovely bookmarks! We were all like teenagers ...talking with each other way into the wee hours, giggling & telling stories about (real) horses we owned. Up at the crack of dawn we headed off into the lobby where the other 200 attendees gathered for a group picture by the Breyer Team. We were assigned different groups, which then indicated what buses we were to head on to...Huckleberry bey, Lady Phase, Silver & Lonesome Glory. Depending on our groups that we had been assigned to, we visited the new Breyer offices in Pequannock. We toured the beautiful spacious offices, got to see the archive room where so many of the rare and special runs were stored. We were then asked to pick a number....which was the number in which we lined up in order to purchase the special run VRE models, limit 2 per person! There were 9 to choose from, but 4 of those were very limited in number, ex. 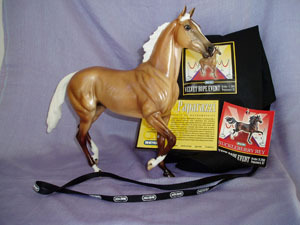 Night at the Oscars (stretch Morgan) was 1/4, Celebrity (Honey Bay glossy PAM) 1/12, Rodeo Drive (pinto bull1/25.) Depending on the number of the run, only a couple were put out for each group of 50 attendees so that it would be fair and everyone would have a chance at the rare ones! 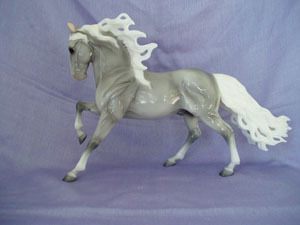 I headed out with Putttin on the Ritz, a glossy taupe Wintersong 1/100 & the glossy Silver Screen Andalusian 1/75 and Becky purchased Ritz & Spirit of Hallowed Eve (Halloween fighter 1/75). We were then given the Velvet Rope Event Special Run, Paparazzi,a lovely smutty palomino Lonesome glory 1/200 with its COA & special Paparazzi tote bag! Off we went with our treasures, ohhhing and ahhhing over them, then on to pick up our boxed lunch to be eaten on the bus until we got to Wayne, NJ where we toured the factory & got to see the step by step process of how the breyers are made and painted, getting to meet the top artists who were painting the VRE horses just for us!